Matter from the Interstellar Medium has been detected by Voyager 1. A postulate of the Electric Sun hypothesis presupposes the Sun to be the positive terminal in a circuit, or anode. The negative electrode, or “virtual” cathode, is known as the heliosphere, a shell of charged particles surrounding the farthest limit of the Sun’s electric discharge billions of kilometers away. A “double layer” at the edge of the heliosphere isolates the Sun’s plasma cell from the galactic plasma. Galactic plasma is also called the Interstellar Medium (ISM). Electric forces inside the layer of charge above the surface of the Sun create the active plasma phenomena that we can observe. Since the Electric Universe theory assumes that all celestial bodies are connected by plasma filaments in vast circuits, the Sun must also be part of those circuits. However, the Sun is not an electrically stable object. Electric charges flow into and out of the Sun, so they can sometimes increase to the point where plasma discharges flash through it. Those tremendous lightning bolts are the solar flares and coronal mass ejections (CMEs). A “solar wind,” or dark mode electric discharge radiating from the Sun, blows outward at approximately 700 kilometers per second. In a gravity-centric analysis, heat and radiation pressure alone cannot explain how the charged particles of the solar wind are accelerated as they pass by the planets on their way to the heliospheric cathode. No solar physicists expected such acceleration until it was discovered. According to the Electric Universe theory, an obvious explanation exists for that anomalous acceleration: a radial electric field centered on the Sun. The easiest way to accelerate charged particles is in an electric field. According to a recent press release, Voyager 1 is now in a part of space that exists between the Solar System and the ISM. Called a “cosmic purgatory” by the Voyage science team, it is where the intensity of solar wind particles has started to decline, as if they are “leaking” into interstellar space. Precisely how these particles “leak” is not explained. Wal Thornhill wrote that the most interesting effects outside the solar plasma sheath will be a powerful electric field accelerating solar wind protons away from the Sun at cosmic ray energies up to an estimated 10 billion electron volts. Electric Universe theory proposes that all stars generate cosmic rays in that way. Perhaps the leakage is occurring because such high-energy solar “wind” particles were unexpected and therefore are not being measured. It is noteworthy, therefore, that high-energy electrons are being detected arriving from the opposite direction—interstellar space. Between stars, in the so-called “vacuum of space,” there is still one atom per cubic centimeter. The ISM consists of gas and dust composed of hydrogen and helium, with a mix of dust grains less than .01 microns in size. Where the dust came from is not known, but astrophysicists think that it is ejected from stars. Some stars are observed with clouds of dust surrounding them. Deep space images reveal “lanes” of dust thousands of light-years in circumference looping around many galaxies, as well. The ISM contains ionized particles, as well as neutral molecules. Those electrons and positive ions are critical to understanding how the Solar System interacts with the ISM. Although it is extremely diffuse, charge separation can take place in different regions, so a weak electric field can develop. An electric field, no matter how weak, will initiate an electric current. Electric currents generate magnetic fields. 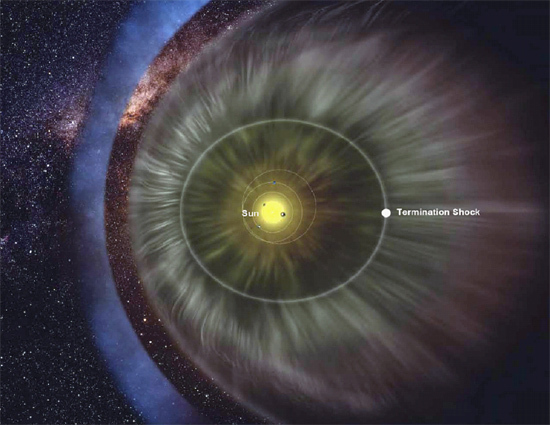 Voyager’s research team has found magnetic fields strong enough to hold the boundary of the heliosphere together. Electric charge must be flowing through the ISM in order to create those fields. We are beginning to map the complex circuitry that couples the Sun to its galactic power source. The IBEX mission has already confirmed Electric Universe expectations of that circuitry. The Voyager spacecraft are now in a position to add some detail to that picture.